In 1986, Pat McInally, a former professional punter with the Cincinnati Bengals, noticed G.I. Joes®, and other action figures in a store, but took note of the fact that none depicted sports figures. 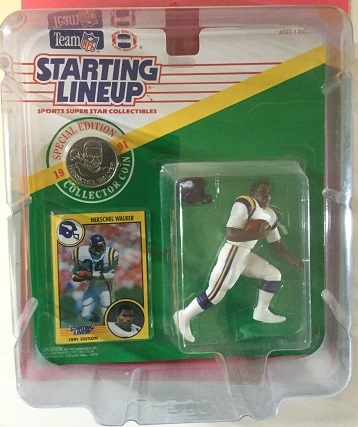 McInally took his idea to a college friend, who was working for the Kenner Toy Co., and the pair decided to start manufacturing sports figures. 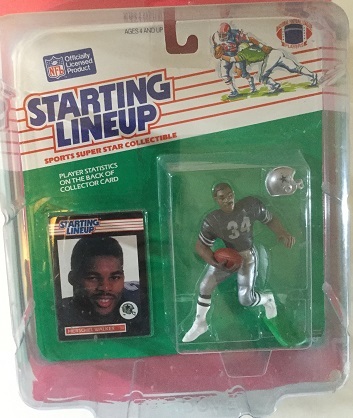 1988 was the debut year for the plastic figures, which were about 4" high. Popular sports heroes of the day were featured, with baseball starting things off, and other sports to follow. 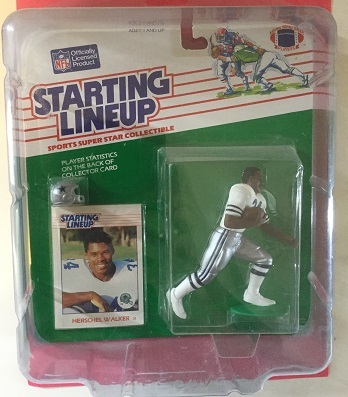 A sports card of the player was included along with each figure. The figures were wildly popular, but were distributed on a regional basis, and it was therefore somewhat difficult to complete sets. The figures were made from 1988 until 2001, with the Hasbro toy company, eventually taking over for Kenner towards the end of the run. Recently, there has been talk that the figures may be making a comeback. Herschel Walker had a total of 6 different sets made. 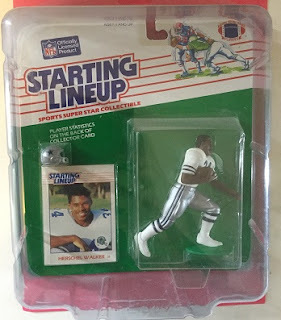 His rookie figure, in 1988, with the Dallas Cowboys, showing him in a white road jersey. 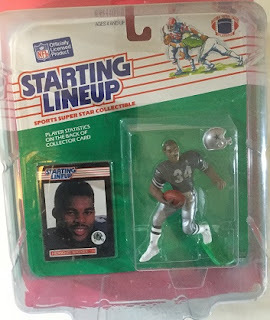 A 1989 figure, in which he is shown in a blue home uniform, again with Dallas. 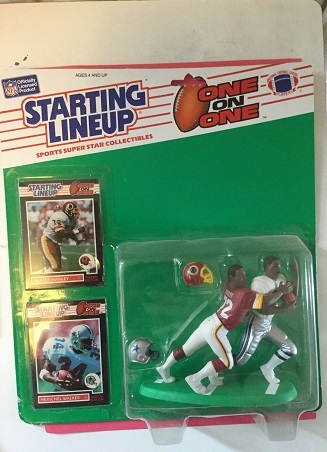 Also in 1989, he was included in a subset series called One on One, in which two figures came in each package. In this example, he is being tackled by Dexter Manley of the Washington Redskins. 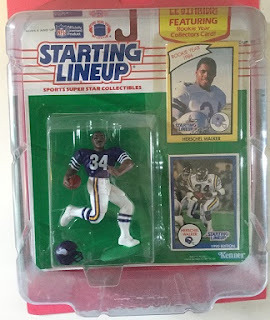 The 1990 edition depicted Walker, who had been traded to the Minnesota Vikings, in a blue home uniform for his new team. In 1991, that year's edition showed Walker in the white road uniform of the Vikings. 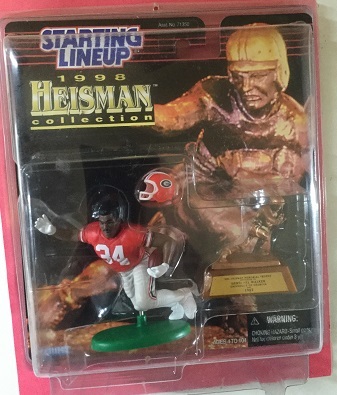 Finally in 1998, Herschel was shown in his Georgia college uniform as a part of the Heisman Winners collection. Here are those figures, which I have in the Herschel Hoard. Note that the plastic case covering each S.L., is a protective cover, and was not a part of original packaging. I'm a big fan of SLU figures. They have made a comeback but as promos only. I know they did a couple NBA figures but they were only available at Charlotte Hornets games. If they go back to retail I will probably start collecting them again.